Who doesn’t love tacos? I certainly do. We have tacos for dinner all. the. time. I don’t go out for them too often because I usually feel like the vegan taco option is such a simple one that I can just make it at home. Of course, I’m always down for Edgar’s! Those tacos are incredible. I found another favorite vegan taco stop in my fair city, and that’s the Pittsburgh Taco Truck. While Edgar’s is more authentic, the Pittsburgh Taco Truck serves up gourmet and fusion tacos. I got to try two of their vegan taco offerings recently, and they blew my mind. 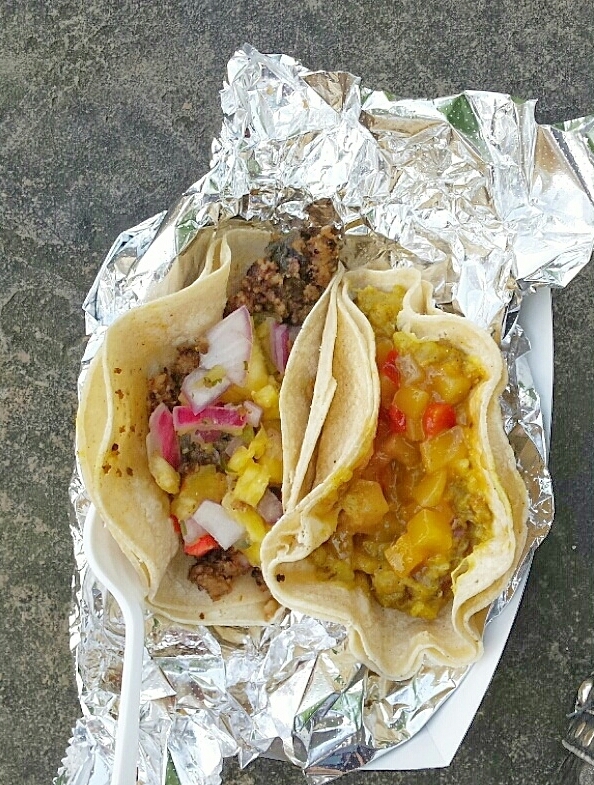 One was curried potato with mango chutney and the other was vegan chorizo with pineapple salsa. They were both so flavorful and unique to any other taco around. I’m really excited that they have such great vegan options, most of which are gluten-free as well. I’m sure I’ll be frequenting them now that summer’s here and I’ll be outside a lot! You can get their tacos from the taco truck (see location schedule here), or you can order them at Gus’s Cafe in Lawrenceville. I highly recommend them!